In the past six years, AHA Centre has been instrumental in promoting better coordination and collective response to disasters among ASEAN Member States, but to accomplish more, a better partnership between the public and the private sector is needed. 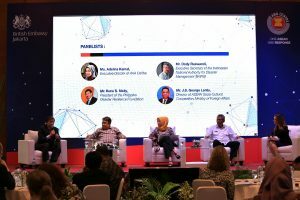 JAKARTA, 5 December 2017 – Today, the ASEAN Coordinating Centre for Humanitarian Assistance on disaster management (AHA Centre) conducted a seminar and a press conference at Graha BNPB, Jakarta, with the theme “Fostering Public-Private Partnerships to Enhance Disaster Management: Towards One ASEAN, One Response” This event was attended by, amongst others, Mr. Dody Ruswandi, Executive Secretary of the Indonesian National Authority of Disaster Management (BNPB); Mr. J.S. 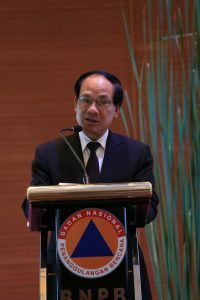 George Lantu, the Director of ASEAN Socio-Cultural Cooperation Ministry of Foreign Affairs of the Republic of Indonesia; H.E. Lê Luong Minh, the Secretary-General of ASEAN; Mr. Rene S. Meily, President of the Philippines Disaster Resilience Foundation; various companies, journalists, and partners of the AHA Centre. The event aimed to promote the Public-Private Partnership (PPP) in disaster management across ASEAN region. The AHA Centre was established in November 2011 as part of ASEAN’s commitment to strengthen the collective response to disasters and to reduce disaster losses. For the past six years, the AHA Centre has been generating several highly visible accomplishments. Hence, to mark its sixth-year contribution to Indonesia and the ASEAN region, the AHA Centre aims to embrace many parties, from the private, public, and government, to simultaneously conduct a dialogue for a partnership in disaster management and a better emergency response. 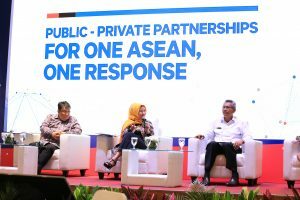 For this event, the AHA Centre engaged more like-minded private sector with CSR on humanitarian assistance or disaster management and others who would support the endeavors for One ASEAN One Response. The event featured an interactive high-level panel dialogue with prominent speakers. The momentum will be used to gain insights and discussion with the potential partners to build an innovative partnership in building a resilient ASEAN Community. The ASEAN Coordinating Centre for Humanitarian Assistance on disaster management (AHA Centre) is an inter-governmental organisation which aims to facilitate cooperation and coordination among ASEAN Member States and with the United Nations and international organisations for disaster management and emergency response in ASEAN Region. The Centre was established by 10 ASEAN Member States; Brunei Darussalam, Cambodia, Indonesia, Lao PDR, Malaysia, Myanmar, Philippines, Singapore, Thailand, and Viet Nam on 17 November 2011, through the signing of the Agreement on the Establishment of the ASEAN Coordinating Centre for Humanitarian Assistance on disaster management in Bali, Indonesia. The Agreement was signed by ASEAN Foreign Ministers, witnessed by the ASEAN Heads of States.